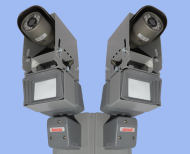 Closed circuit television systems have continued to have a very high profile over the past decade, but Allguard, est. 1989, actually started to specialise in this field some 29 years ago. The setting up of high street systems brought CCTV to the forefront and the consensus from the general public is that they feel safer knowing that there is a surveillance system in operation in their own town. Companies and business' started to realise the value of CCTV as a natural progression to security, and, as an added deterrent to the "would be" trespasser. Allguard took CCTV a stage further by incorporating a monitoring control centre (back in 1990!) working along the same lines as the monitored high street systems into our offices based in then Queenborough, Kent. Many of the customers that we have listed in the Customers section have used us for crime prevention, 24 hours a day, and all after office hours when we become their eyes using the latest technology has to offer, but very simply transmitted via the ADSL broadband network as well as mobile 3G/4G, fibre optic, satellite and WiMax connections. We endeavour to meet our customers requirements wherever possible but also advice on best practice for the location and installation of the cameras. Please remember we are there to help you and not to sell you the latest and greatest 8k UHD CCTV system if you don't really need it. A monitored system is very simple, whereby cameras become the eyes of your site, sensors detect movement and if this occurs during a period when the premises should not be occupied, then the system communicates immediately with us to allow our control centre to identify the intrusion. Allguard are always on the lookout for talented new staff to improve our team. We are based on the Isle of Sheppey in Kent so ideally you will need to live in that area for office duties, however, we will be interested for any installation engineers countrywide that are willing to assist us. Particular areas of interest to us are Dorset, Devon and Cornwall.